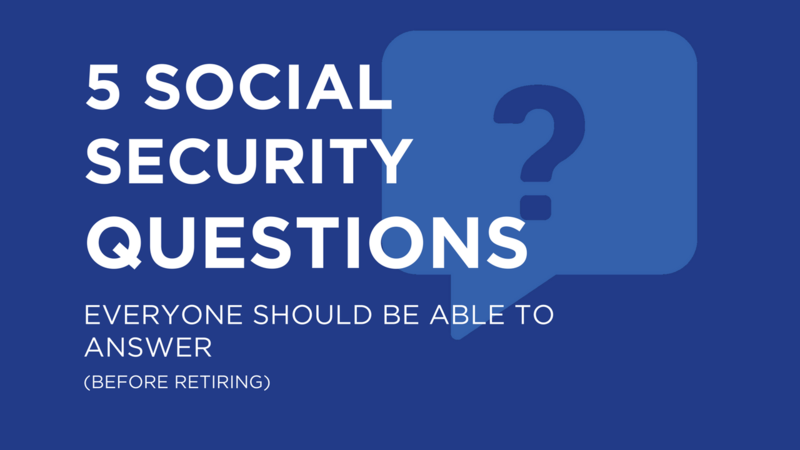 Can You Answer These 5 Social Security Questions? There’s been a serious tug-o-war going on between two groups. On one side, there are the people who believe that you should take Social Security as soon as possible. And on the other side, there’s the group who firmly states that you should wait until you get the biggest benefit. The arguments on both sides have left many people stuck in limbo because they’re afraid of making a mistake and it’s been hard for them to figure out what’s best. You can elect Social Security as young as age 62 but the benefit will be permanently reduced. If you start your benefit at your Full Retirement Age (FRA), you’ll receive what’s referred to as your full benefit (100%). And if you delay the start of your benefit until after your FRA, you’ll get more because you'll receive Delayed Retirement Credits. This can increase your benefit by 8% per year with a maximum at age 70. But, that’s only one part of your retirement equation. Because the age at which you start receiving Social Security can have a long-range impact on your retirement savings like TSP—good or bad. Figuring out when the best time to start getting your benefit can be challenging. You can use these 5 questions to help you clarify your options. No. 1 How Much Social Security Will I Get If I Start Taking My Benefit At Retirement? Yes, this is a basic question, but resist the temptation to skip the answer. Keep reading! You’ll need your Social Security statement. If you don’t have a current statement, you can download your statement here. Determine your age at retirement in years and months (yes, really months). Because Social Security will calculate your benefit by counting your age in years and months! Look at your Social Security statement to find out how much you’ll receive each month. If your desired retirement age (year/months) is not shown on your statement, then there’s a quick extra step you’ll need to take to figure out the answer to this question. 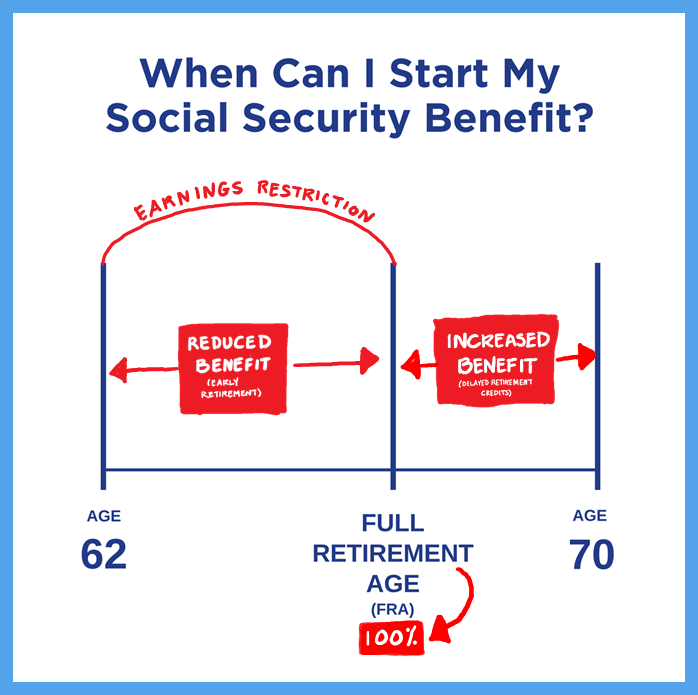 Use the chart from Social Security to estimate what your benefit will be. Find your year of birth, click to open up the chart. Find the column, “Wage Earner, the Retirement Benefit you will receive is reduced to,” and the percentage based on your corresponding age in years and months. This is a percentage of your Social Security benefit at your Full Retirement Age (FRA). To figure your estimated benefit, multiply the percentage by your Social Security benefit at FRA listed on your statement. If you’ll be electing Social Security after your Full Retirement Age, then you’ll receive Delayed Retirement Credits. This means that your Social Security benefit will be increased by 8% for every year you delay taking Social Security after your FRA up to age 70. Your benefit will be calculated based on how many years and months since the month of your FRA. To figure your estimated benefit, multiply the percentage increase by your Social Security benefit at FRA. Add that amount to your benefit at FRA. No. 2 How Much MORE Social Security Will I Get If I Wait? This is the next big question! If you’re under age 70 when you retire, then waiting to collect Social Security will give you an increased monthly benefit for the rest of your life. Decide how long you would like to delay starting your benefit. Then look at look at your Social Security statement. If the age you’d like to use for this comparison isn’t shown, then follow the steps listed under Question 1 to estimate your future benefit. Subtract “delayed” increased benefit amount from the “retired now” amount. Multiply the answer by 12 months and you’ll have the estimated yearly additional amount you’ll receive by waiting until that age. The conversation turns into the question: Will it be worth it to wait? No. 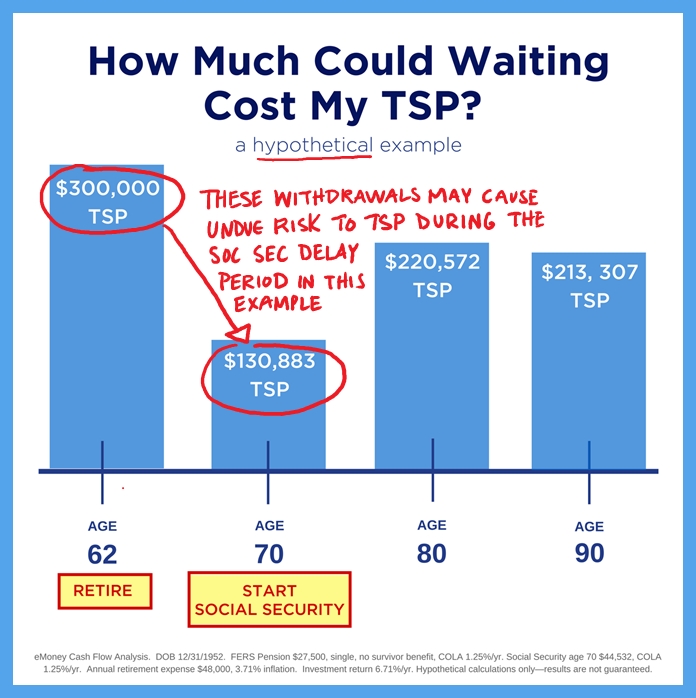 3 How Much Could Delaying Social Security Cost Me From TSP? This is an important question to thoroughly explore and evaluate. This is because if you delay starting your Social Security benefit after retirement, you’ll need to calculate any TSP/retirement savings withdrawals needed to cover a shortfall during that period. This step can be critical in your decision-making process. Let’s use this hypothetical example to illustrate a concept. Franny FERS retired at age 62, and decided to delay her Social Security benefit until she is age 70. She’s intent on maximizing her Social Security benefit. She started retirement with $300,000 in her TSP. Due to her expenses, she’ll need to take pretty sizable withdrawals from age 62 to 70 to cover the shortfall. Let’s look at the effect of these withdrawals on her TSP. You can see on the chart that at age 62 she started retirement with $300,000, but look what’s happened to her TSP balance by age 70. It’s been eroded substantially by the withdrawals to cover expenses during the delay. 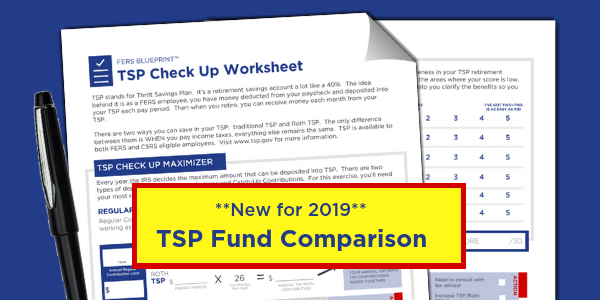 In this hypothetical example, TSP is down to $130,883. That’s a decrease of $169,117 in eight years. This could place Franny FERS’ finances in a precarious position. Because if there’s a loss in her TSP due to volatility in the stock market, or maybe if she has an unexpected additional withdrawal, her risk of running out of money substantially increases. Do you think Franny should consider other options like beginning Social Security at retirement or maybe delaying Social Security for only one or two years? Yes, she should definitely weigh other options. 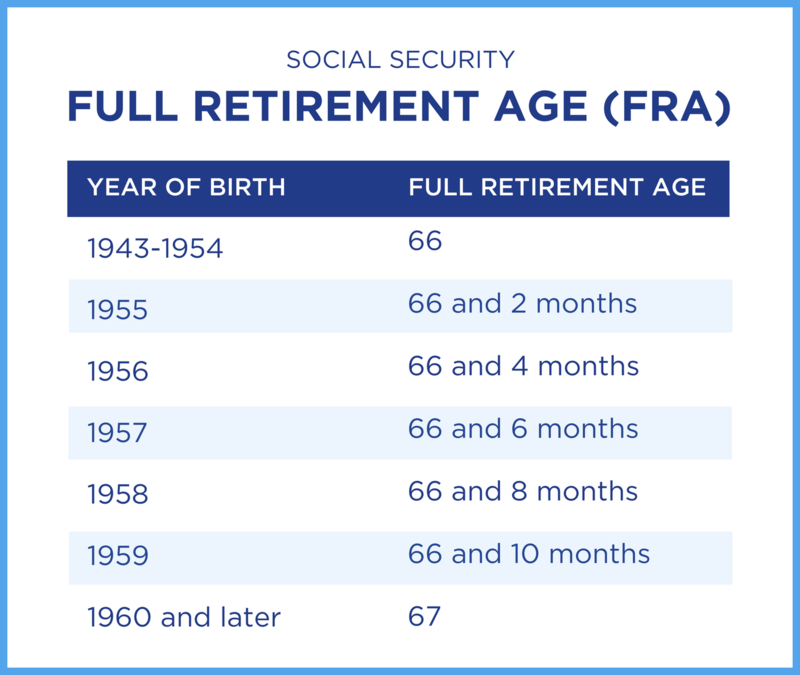 This is why it’s critical that you know how to test out various options when you’re deciding to start or delay your Social Security! Keep in mind, your actual scenario will be different from this hypothetical example. You’ll need to estimate your own potential shortfall and/or benefit of increased income from delaying Social Security. No. 4 Are there any earnings restrictions on my Social Security benefit? Yes! You need to be aware that there are special earnings restrictions that apply if you’re receiving Social Security before your Full Retirement Age (FRA). This can reduce or eliminate your Social Security benefit. When Social Security figures out how much to deduct from your benefits, they count only wages you earn from your job or net earnings if you’re self-employed. This includes bonuses, commissions and vacation pay. Social Security does not count pensions (such as FERS), annuities, investment income, interest, veterans or other government or military retirement benefits. If you’re UNDER FRA for the entire year in 2017, then Social Security will deduct $1 from your benefit for every $2 you earn above the annual limit of $16,920. If you will REACH your FRA in 2017, then Social Security will deduct $1 from your benefit for every $3 you earn above $44,880. But they only count earnings before the month of your FRA. Bear in mind that starting with the month you reach your FRA, there are no earnings restrictions. No. 5 How Will My Social Security Strategy Affect The Spousal Benefit? Electing Social Security under your Full Retirement Age (FRA) will permanently decrease spousal benefits. If your retirement plan includes the use of Spousal Benefits, then it’s important to include that reduced estimated amount in your planning. This calculator from Social Security may help you to compare various scenarios. If you elect Social Security at your FRA or older, Spousal Benefits are not affected. ‘Silo decision making’ is when a farmer only considers what’s in the silo, but neglects the other animals or crops in their decision. That type of decision making isn’t very good in farming or in retirement planning! There’s an inherent danger in only considering one fact when making almost any decision because you may be unintentionally missing other key factors. For example, it is true that delaying Social Security will give you more money each month, but relying on that fact alone may leave your TSP or other retirement savings at significant risk. Clarify your Social Security options so that you can have a sound strategy, avoid mistakes, and feel confident nothing important is overlooked.